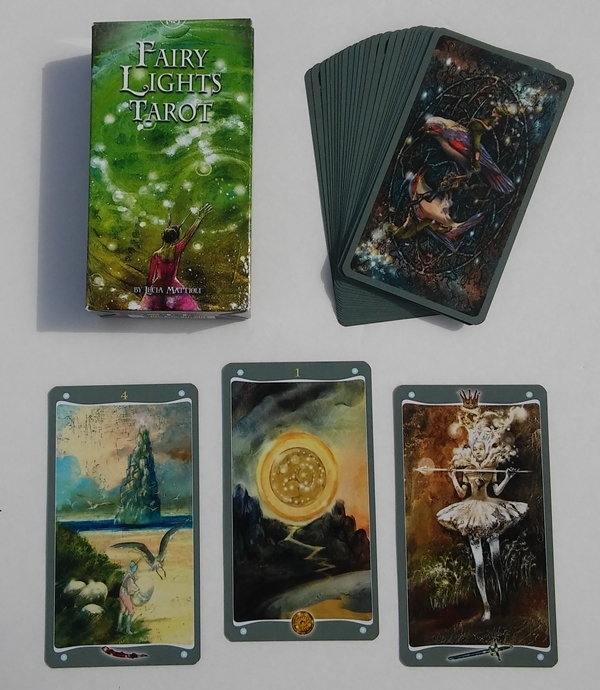 Fairy Lights Tarot is an amazing, magical deck by Lucia Mattioli, the artist of the incredible Tarot of the Secret Forest. Mattioli always gives us something extra with her decks. 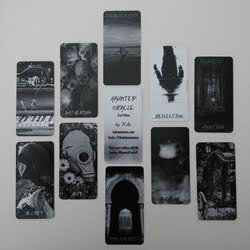 With the Tarot of the Secret Forest, the cards are double sided; the backs of the cards are black and white rough images of each of the fronts. With this deck, the Fairy Lights Tarot, each card is half of a painting, with its other half to be found somewhere else in the deck. The cards measure 2 5/8" x 4 3/4". They are standard Lo Scarabeo stock, so they are matte and shuffle beautifully. The backs are not reversible, but the image is busy, so it would be hard to tell which end was up. The borders are a neutral grey. There are no words on the cards at all. There are four fairy orbs on each card, one in each corner. At the top is the card number (Majors are Roman numerals, Minors are regular numbers) or Court symbol. At the bottom is a suit symbol for the Minors, and a repeat of the Roman numeral for the Majors. Having the number appear twice on the Majors seems unnecessary. But I do like that there is no wording on the cards. 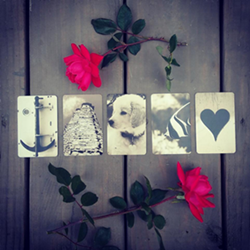 Each card forms a full image with another card in the deck. The images are not in order. For example, The Fool and Magician aren't a pair. I don't know the process of how the artist painted these images or how she assigned the cards to each half. What I do know is that I spent a great part of an evening matching them all up and writing down the matches. This way if I ever wanted to see a card's other half, I could easily reference it. This would have been helpful to have in the LWB. But I'm just nerd enough to have done it myself. I know I say this of almost every deck, but I really wish this one was borderless, almost achingly so, because then the images that go together would be seamless when put together, rather than having a border down the middle of them. Unfortunately the uneven shape of the borders (and the suit symbols intruding into the images) don't lend themselves to easy trimming. The cards are filled with otherworldly creatures. Fairies and dinosaur-looking creatures, and creatures I don't have categories for. I love looking at all of them! The images are soft and comfortable to look at. It's a magical world with gentle colors, yet there is a beautiful darkness about it as well. 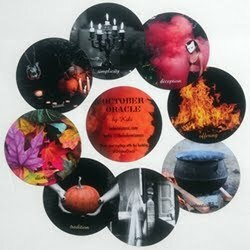 There are so many magical things happening in the cards, and so much left up to your imagination and interpretation. 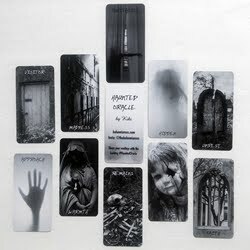 The stories you can create with these cards are endless, every combination of images pulling you into a different story. The very first reading I did with this deck, I drew two cards and they miraculously happened to be a pair! And not only that, but they were drawn in the correct order (first the left then the right). It was really amazing. I knew it was a sign that I would be working very well with this deck. That first week I had a few repeating cards, another sign I get when I am connected with a deck. One day I drew the Knight of Wands and Two of Wands. But I was too busy to do the reading, so I just set the cards aside for later, and then never had a chance to get back to them. They went back in the deck the next morning. Then, for that next day, I drew the Two of Wands and Two of Pentacles, in that order. So since the Two of Wands came back from the day before, this seemed like a continuation (with the Two of Wands being in the middle position, bringing the other two cards together), so I decided to get out the Knight of Wands, and read them in the order they appeared, as one fluid reading. Knight of Wands + Two of Wands + Two of Pentacles. This reading was incredible. It read like a story, flowing effortlessly. Another card I pulled that first week was the Ace of Wands where I saw a new tree growing out of a dead one. I had pulled this card after going on a Trump rant on Instagram regarding the Muslim ban. I pulled this card and thought, "Good will come of this." Later that day was the huge protest at JFK and other airports. Lawyers working pro bono. Protesters shouting for love and tolerance. So much love. So much goodness. My rage turned into tears of pride and love. The card nailed it. Good coming from bad. Oddly, during the week I worked with this deck for my daily readings, I didn't draw a single Major Arcana card. This deck is amazing for intuitive readings. I have relied solely on the card images, not even noting the card's title or traditional meaning. For this reason, I personally find it more of an oracle than a tarot deck. It gives such amazing readings, such incredible insights. The readings flow so naturally and organically. It's like being pulled into another world and just automatically knowing the story in front of you, rather than having to try to interpret it. In the LWB, there are two examples of reading the cards that go together as one painting. I don't know if you are meant to draw a card and then find its partner? I didn't read the cards this way and don't intend to. Although if I had a further question for the cards, instead of drawing a random clarifying card, I might seek out the partner of the card in question for additional insight. And if the matching cards happened to fall together, I would place great significance on that. The LWB is 63 pages, with the English portion ending on page 14. This is followed by translations in Italian, Spanish, French and German. It begins with a half-page general introduction to tarot and this deck, though it doesn't go into how the paintings were separated into cards. Most of the card meanings are two sentences long. No reverse meanings are given. The Knave (Page) of Wands is "One who brings a strong memory from your past that will clarify the present in an unexpected way." I found this interesting... not an interpretation I had heard before. The Knight of Chalices is "One who fights the battles of those who do not have the strength to fight for themselves." I loved that. The Queen of Swords is "One who shares the brilliant clarity of her mind, but protects her heart with a certain reserve and caution." And the King of Pentacles is "One who builds for the future, drawing on the traditions of the past as his foundation." All of the Court cards were done really well. There are no spreads in the booklet. It ends with two examples of reading the cards that go together as one painting. I am in love with this deck and the readings it gives. It is a wonderland for the intuition. 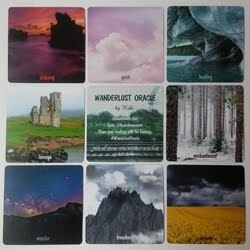 It is not a traditional tarot deck. If you are a beginner and looking for cards with which to learn the RWS system, this would not be your best bet for a starter deck. But if you want a deck that will make sublime use of your intuition, this one definitely fits the bill! I really can't say enough how fluid this deck reads for me and how beautifully it connects me with the higher part of myself that knows the heart and truth of the matter. Deck: Fairy Lights Tarot by Lucia Mattioli, published by Lo Scarabeo, distributed in the US by Llewellyn. Free Spirit. Introvert. Ethical Vegan. Bookworm. Deck/Book Reviewer.